Father and son hate preachers Shaykh Naqeeb ur Rehman and Shaykh Hassan Haseeb ur Rehman from Pakistan have returned to the UK to embark on another tour of the nations mosques. Chief executive of the Ramadhan Foundation is none other than the go-to Muslim media personality Mohammed Shafiq. The so-called ‘moderate Muslim’ is a regular face on our TV screens, giving his twopence worth on anything remotely Islam related.He is always prepared to be the spokesman for all Muslims, even if he doesn’t actually have a clue what he is commenting on as long as he gets his fame hungry face on camera. : “The Ramadhan Foundation in partnership with the Shaykhs of Eidgah Sharif are hosting this important conference to send a clear message against terrorism. Those that carry out these evil crimes, finance them or support them are enemies of the whole of humanity.”. The extremist clerics controversially toured the UK last summer and their presence here was heavily criticised with many left scratching their heads and wondering why the Home Office granted them entry into the country when prominent counter jihad experts like Robert Spencer and Pamela Geller were denied entry visas for literally telling the truth about Islam. At the time a Scottish MP even went as far as to ask in Parliament why the Muslim hate clerics had been given an entry visa when their presence here is not for the good of the nation. Since that visit one of the clerics found himself in a spot of bother with the law in his native Pakistan. Where he was arrested and spent time in jail after he and 5 of his devoted followers come bodyguards harassed a Supreme Court judge in front of his children..
Hafizabad Police have arrested Pir Shaykh Muhammad Hassaan Haseeb custodian of Darbar Eidgah Sharif along with his 5 Mureeds and court remanded them to police for 20 days. They were arrested on 27 may 2017 and next day all 6 of them were remanded for 20 days in Gujrawala Court.This is the First Picture of Pir Hassaan Haseeb Ur Rehman along with his followers behind bars. They were arrested for harassing a Supreme Court judge and his family at Lahore-Islamabad Motorway. After which Justice Sardar Tariq Masood, Judge of Supreme Court of Pakistan reported it to police who put them behind bars. Speaking to the Oldham Chronicle, Shahbaz Taseer, whose father was the Pakistani politician murdered by Mumtaz Qadri, criticised British authorities for allowing Shaykh Naqeeb ur Rehman and Shaykh Hassan Haseeb ur Rehman into the country. “These people teach murder and hate. For me personally I find it sad that a country like England would allow cowards like these men in. 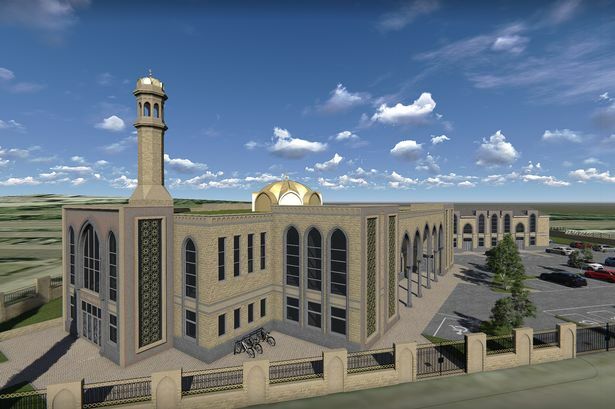 Who is funding the new monstrosity of a mega mosque costing 8.3 million pounds in Accrington? Those involved in the running of the mosque claim it is from public donations which i find hard to swallow. Are the Muslims of Lancashire really that wealthy that they can magically stump up 8.3 million pounds between them after passing the collection bucket round? Or is it the oil rich wahabis from Saudi who have paid for its construction knowing the mosque will then have to push their own extremist version of Islam to those attending? How did a mosque to hold 900 people with only 70 odd parking spaces pass planning? Maybe the local councillors involvement there could be something to do with it? The new £8.3 million Raza Jamia Masjid and Link Community Centre in Accrington. 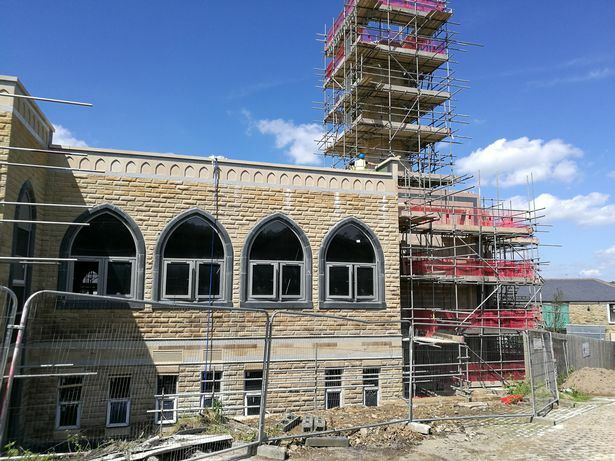 A new £8.3 million Accrington mosque is set to open later this year. The Raza Jamia Masjid Mosque, being built between Grimshaw Street and Lower Antley Street, will be able to hold nearly 900 people for prayers and worship. The development will also include a community centre which will be open to residents of all faiths and backgrounds for meetings, events and sporting activities. Planning permission was approved back in June 2014 and the 1.3 acre site has been transformed over the last three years into the eye-catching two-storey facility. Mosque leaders said they were hoping to open by May this year, however they are now aiming to complete the development by October. Jawid Hussain, who manages the project, said: “It’s brilliant. It looks very good and very impressive. A lot of work has gone into it. 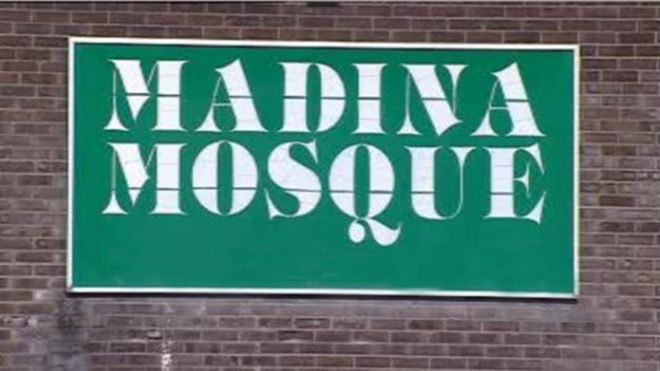 Jawid said all the funding has come through private donations and that they will retain the old mosque on Grimshaw Street for evening classes. The new mosque will include three prayer halls and a library and the community centre will feature an Islamic funeral room, community facilities and dining areas. The site will also include a 71-bay car park with six disabled spaces. Councillor Munsif Dad, who is a member of the mosque, said: “It’s all coming along very nicely. It’s a very large development and will be a facility for the whole community and for Muslims. Very good news coming out of Greater Manchester for a change. It seems that plans for a new mosque come stealth jihad control centre for the leafy suburbs of Altrincham and Hale have been shelved for now. The controversial construction project would have seen a new mosque built on green belt land. The proposal caused fury amongst the local residents who vigorously opposed the Islamization of their area and took to the streets in vast numbers to protest against the mosque. Well done to all those involved. Its a shame more ‘normal’ people in other areas facing mosque construction are not equally as passionate about blocking them being built in their own neighbourhoods. Instead of doing nothing as Islamization is taking hold on their doorsteps. A Trafford Muslim group behind plans for a huge new Islamic community centre say they been put on hold following the announcement of Greater Manchester’s green belt masterplan rather than protests by residents. The Altrincham and Hale Muslim Association (AHMA) want to build a new, 2,000 sq m, two-storey centre on green belt land in Timperley. The controversial plans sparked a number of demonstrations, with hundreds of people taking to the streets – and more than 2,000 signing a petition opposing the new centre. Bosses say they have outgrown their current base in nearby Hale and that there are no other suitable sites available. The new centre would sit on disused land on Thorley Lane. The association’s plans have now been withdrawn, with all traces removed from Trafford council’s website. The group say the project has been put on hold because of the region’s 20-year housing plan, which includes proposals for sites on and around Thorley Lane. The Greater Manchester Spatial Framework (GMSF) suggests building homes on the land, as well as community and commercial space, redrawing the green belt in the process. AHMA bosses say they’ve put their plans on ice for the time being, pending ‘clarification’ of GMSF plans. A spokesman for AHMA said: “As residents will be aware, it is proposed to amend the green belt and a number of sites around Thorley Lane are allocated in the draft GMSF for residential, commercial and community development, including the site of the proposed new AHMA community centre. 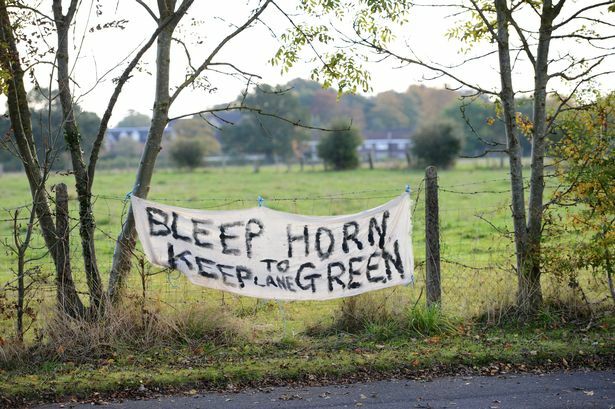 “With this in mind, the AHMA has decided to place on hold the planning application for at this time, until the situation relating to the GMSF has been clarified. “However, the AHMA is committed to delivering the new facilities, which are so desperately needed for the growing local Muslim community. Those opposed to the plans say there are plenty of other community centres in the area and have objected against development on green belt land. There are also fears the new centre would cause traffic chaos. 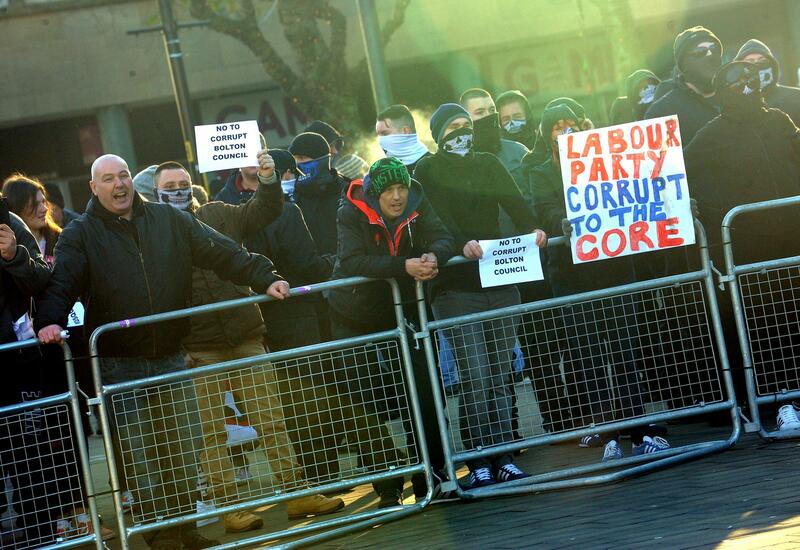 Despite one protest attracting attention from far-right groups, including the English Defence League, campaign organisers insisted the demonstration had ‘nothing to do with religion, race or politics’. 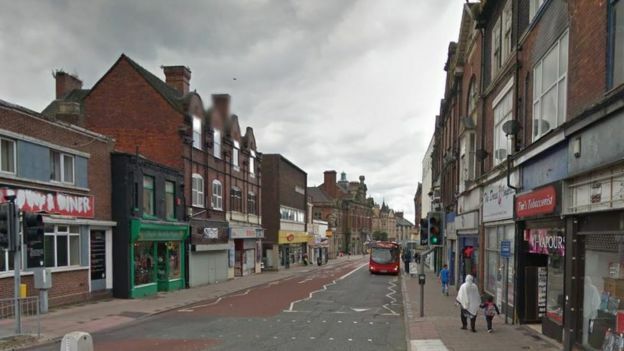 An imam at a Coventry mosque has been arrested over allegations of child abuse.The 45-year-old, who is based at the Islamic Brotherhood Coventry, at the Noorul Islam Jamia Mosque in Eagle Street, was detained by police on suspicion of wilfully ill-treating a child. 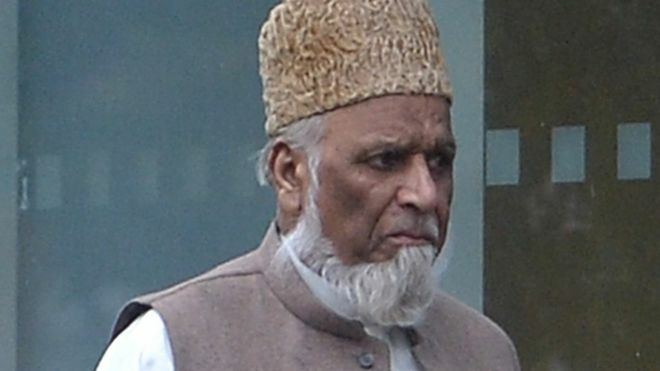 Hen was arrested last week after CCTV footage was provided to them which allegedly shows the imam striking a child.A spokesman for the mosque said they are co-operating fully with West Midlands Police. Police had the CCTV footage and are pursuing their inquiries, and the imam is on police bail.”We and the imam are fully co-operating with the police investigation or any concerns they have about the incident.“Police may have concerns but we did not receive any complaints thus far from parents or the children. Common sense has once again gone out of the window in favour of senseless Muslim appeasement.A Pakistani hate preacher deemed that much of an extremist agitator that he is banned from publicly speaking in his own Islamic homeland is allowed to enter the UK to speak at a mosque in Falkirk, Scotland. Radical cleric Syed Muzaffar Shah Qadri makes no secret of his support for those who murder in the name of Allah!! You would think alarm bells would be ringing but no it doesn’t seem to be a problem for the powers that be as they once again bend over backwards to accommodate islamofascists. Note self appointed judge, jury and executioner of all things that he doesn’t like, Mr Fiyaz Mughals rather lame statement in the article. 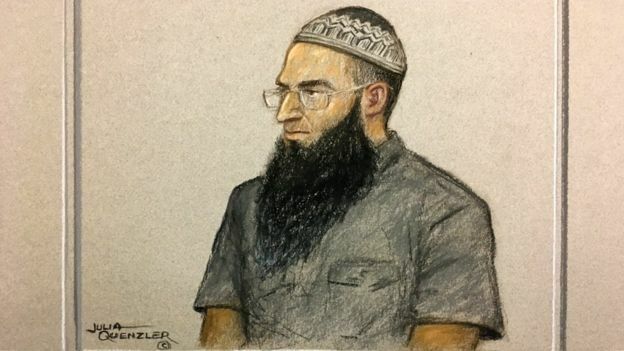 This is the same guy that lobbied the government until he got leading counterjihad experts Robert Spencer and Pamela Geller barred from the UK who do not support murders or promote violence. 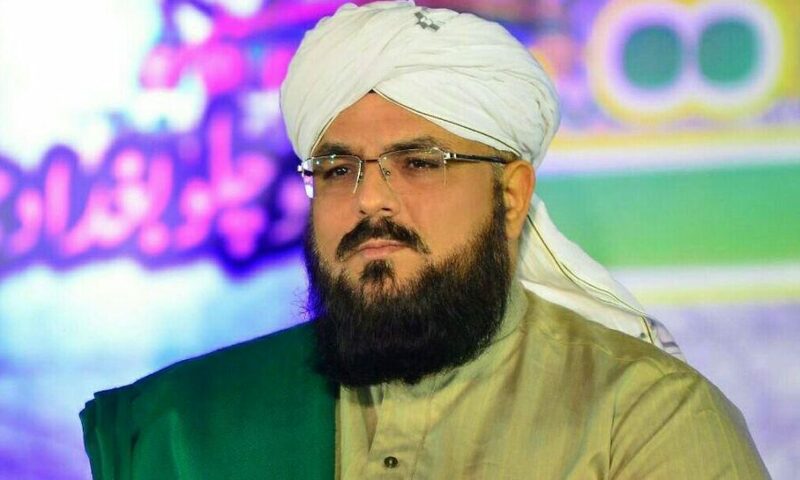 A BANNED Pakistani cleric whose warped ideology is linked to the murder of popular Glasgow shopkeeper Asad Shah is to spread his message of sectarian intolerance to Scotland. 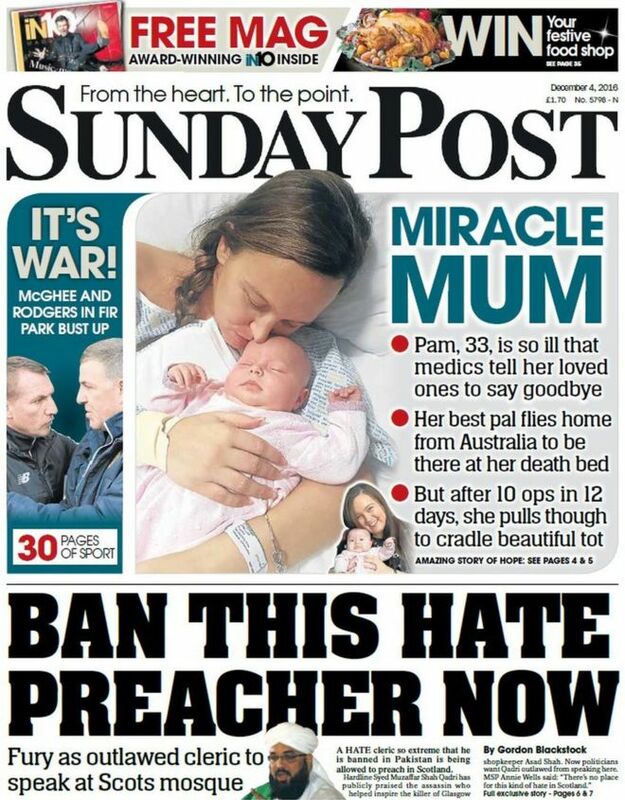 Hard-line preacher Syed Muzaffar Shah Qadri is due to speak at Falkirk Central Mosque later this month – despite praising a murderer linked to the killing of Glasgow shopkeeper Asad Shah, who was stabbed 27 times after wishing his customers a “Happy Easter”. The Sunday Post can reveal the zealot has been labelled a “firebrand” by the authorities in Karachi, Pakistan’s largest city, and barred from preaching his incendiary sermons. Yet despite the ban imposed on him in Pakistan, Qadri has faced no obstacle against his speaking at the Falkirk place of worship on December 15. Flyers promoting the event are currently being circulated and appear on the mosque’s Facebook page. While there is no suggestion regular worshippers share Qadri’s views, the development has concerned politicians, and comes as Nicola Sturgeon prepared to visit members of the Glasgow mosque where Asad Shah worshipped today. MP Siobhain McDonagh, who has campaigned for a clampdown on extremists preachers entering the UK, last night said she was shocked Qadri was being allowed to travel from Pakistan. She said: “I’m amazed that somebody can be banned in Karachi but get entry clearance to the UK. 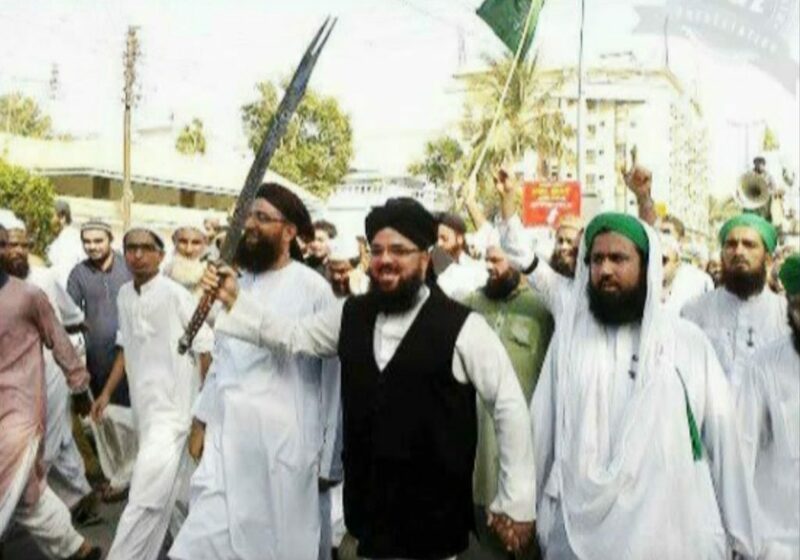 Allama Syed Muzaffar Qadri is a supporter of Islamist assassin Mumtaz Qadri, who murdered popular Pakistani politician Salman Taseer for speaking out against the country’s brutal blasphemy laws in January, 2011. 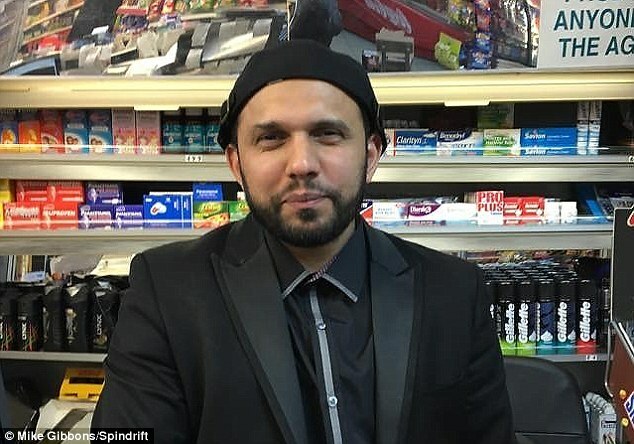 The same brutal killer was also idolised by Bradford taxi driver Tanveer Ahmed, 32, who butchered peace-loving shopkeeper Asad Shah, 40, in a copycat killing the day before Good Friday this year. The Sunday Post has obtained and translated footage of Qadri delivering sermons, where he praises the political murder which inspired a bloody rampage by the knife-wielding cab driver. The authorities in Karachi have described Qadri as acting in a manner “prejudicial to public safety and maintenance of public order”. 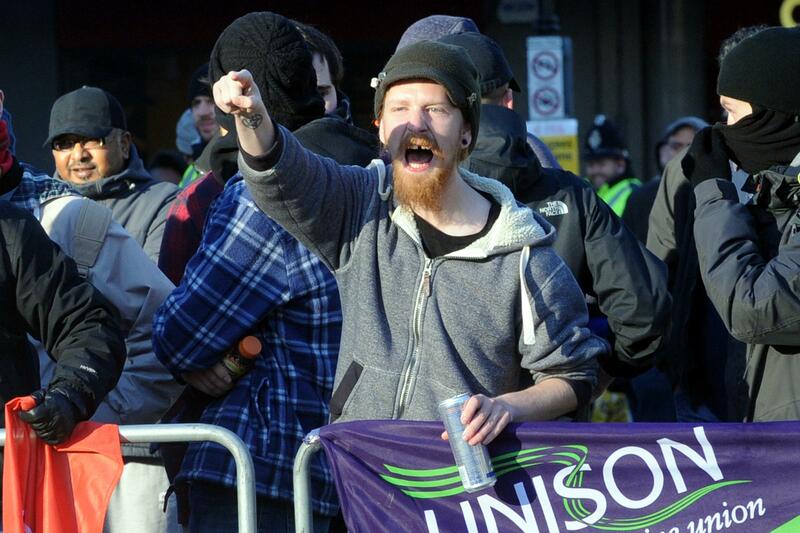 He was banned from addressing crowds in October, according to a legal document seen by The Sunday Post. As news of his arrival in Scotland emerged, there have been calls to have him banned. Scottish Conservative equalities spokeswoman Annie Wells MSP has also raised questions about the event. “If this individual is deemed too extreme for Pakistan, then that tells you all you need to know about his views,” she said. Sources in Pakistan claim Qadri’s speeches have become highly controversial in his homeland. Our source said: “It’s amazing British authorities are allowing someone to spout this nonsense in the UK – especially since he’s banned in Pakistan. In Falkirk, people were shocked at the planned event. One local pensioner, Duncan Walker, 69, said: “It depends on his ideas. We don’t want him recruiting young people into these situations, especially with IS in Syria. “He’s a radical. There’s an agenda you could follow. There’s got to be a limit. Michael McMurtagh, 44, who works as a driver in Camelon, near Falkirk, said: “The murder of the man in Glasgow’s south side was truly appalling. “Everyone across the country was shocked by it. Last week Tanveer Ahmed, who claimed to have killed Mr Shah for “disrespecting” Islam failed to have his minimum 27-year jail-term cut. The Shah family moved to Scotland from Pakistan in the 1990s to escape persecution as a result of their religious beliefs. On the day he carried out the murder, he watched a clip featuring Mr Shah on his mobile phone as he travelled to Glasgow. At the shop, Ahmed warned the shopkeeper he was there to kill him and asked him to stop claiming to be a prophet. Ahmed was sentenced to life at the High Court in Glasgow after admitting the murder. He stabbed Mr Shah 27 times in a cold-blooded “tribute” to his hero Qadri. Appeal judges have now ruled Ahmed’s jail term was legally sound. Last night, a spokeswoman for the Home Office said it would not comment on individual cases. One of the organisers of the event said: “This is the first I’m hearing he’s banned in Pakistan. “There is a lot of political things happening there at the moment so it wouldn’t surprise me if he was banned. “I don’t think he’s particularly extreme. “I’ve not watched any of his sermons and don’t know what he’ll talk about. 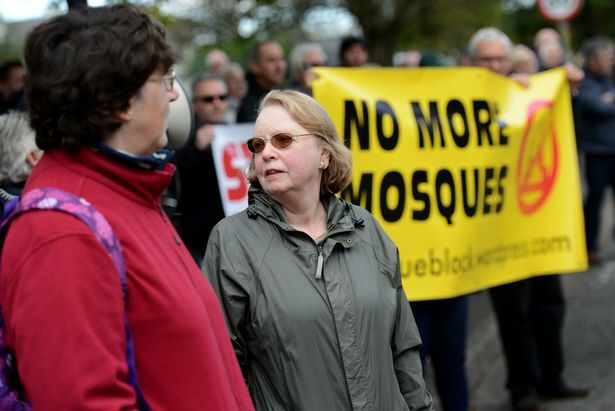 Concerned citizens in Bolton yesterday held a protest against yet another planned mega mosque for the town. The huge mosque construction was recently given the go ahead by Bolton’s Labour controlled council despite a significant lack of parking spaces and concerns of local non-Muslims about the monstrosity building. 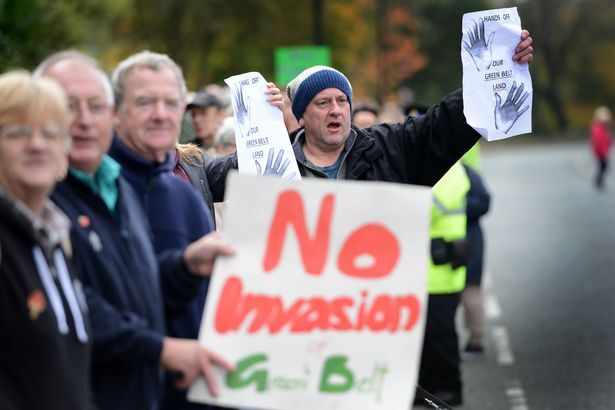 Bolton council have a long history of Muslim appeasement and assisting in the Islamization of their own town at the expense of indigenous residents. Bolton council is helps pay for Muslims stealth jihad by providing funding to umbrella group Bolton Council Of Mosques to the tune of over £1 million of local authority money. The 3 storey mega mosque is to be built in the Great Lever area of Bolton. The proposed mosque is set to come with a huge dome roof and massive 130 metre high minarets which will dominate the local skyline.Bolton at present already has 28 operating mosques many of which are large buildings and cause a great deal of disruption to the surrounding areas. The SWP front group despise free speech and do not believe in people being able to voice they opinion unless it is the same view as their own or by non white Brits. UAF communists fail to grasp that opposing Muslims stealth jihad and aggressive islamization tactics does not make you a nazi like those of Hitler’s Germany. It is called having the sense to defend your future freedoms. The Great Lever mosque proposal is the latest approved construction from a long list of controversial applications to be granted planning permission from Bolton’s Muslim loving council. Last year the Labour Council went out on a limb to appease the local Muslims by passing planning permission for two other highly controversial mosque constructions. One in Farnworth and a mega mosque on Blackburn Road. According to the Muslims behind the proposal the current mosque is to small for the 50-150 Muslims that go to worship there. Yet according to certain Islamic websites that have mosque directories. The current mosque already has a capacity to hold 950 people, which would mean plenty of space to accommodate an increase in numbers attending. The picture below shows the current mosque which the Islamists behind the project claim is too small to hold 150 people. As part of the proposal the building shown above will stay ( shown on the right in the image below.) and the new building will not actually be a replacement but a huge add on. This gives some idea on how large the planned development is going to be. The leaflets are not only a Muslim committed hate crime but a clear incitement to commit murder. Muslim apologists always claim that Islam is ‘the religion of peace’ and any nefarious actions are carried out by people who are not real Muslims. If any of that was remotely true how do they explain this one away…….You cant find a place more Islamic than a mosque and you can hardly say its Imam is a fake Muslim given his standing in the Muslim community. How much longer are British authorities going to continue pussyfooting around Muslims and their Mosques allowing Islamofascist clerics to spout their racist and religious hatred to the Muslim masses. The longer they are allowed to continue getting away with it the more trivialized and widespread it will come. Would Tommy Robinson of got away with handing out leaflets inciting murder to Muslims at a Pegida or EDL protest??? Not a chance, he gets a charge sheet for holding a flag saying ‘f*ck ISIS’ whilst abroad so would have been arrested long before handing any leaflets out. So why are Muslims given special treatment by the police and do and say as they wish without prosecution. A Standard investigation has uncovered claims that the booklet, which says “any Muslim should kill” those who insult the Prophet Mohammed, was distributed at a gathering in Walthamstow.It points to a classical manual of Islamic law to justify killings without waiting for court judgments and says apostates “deserve to be assassinated”. The leaflet was allegedly handed to some worshippers at the Dar-ul-Uloom Qadria Jilania mosque in Walthamstow . The Standard has learned that the leaflet carries the name of preacher Syed Abdul Qadir Jilani on its front cover. It came to light after it was allegedly handed to some worshippers at the Dar-ul-Uloom Qadria Jilania mosque in Walthamstow, where Mr Jilani is an imam. Mr Jilani, who once landed a British-Pakistani TV network in trouble after it showed a live sermon with him allegedly “advocating violence”, denies writing the booklet despite his name being on the cover and his picture appearing on the back.He told the Standard the booklet had been “falsely attributed” to him, that he did not “authorise” the use of his name or picture and did not give permission for any of his sermons to be reproduced. He said he did not agree with the booklet’s contents and that he did not know “if, why or how” it was distributed in the mosque.He added that if it had been distributed in the mosque, then this had been without his knowledge and “without authorisation by either me or any member of the committee”. 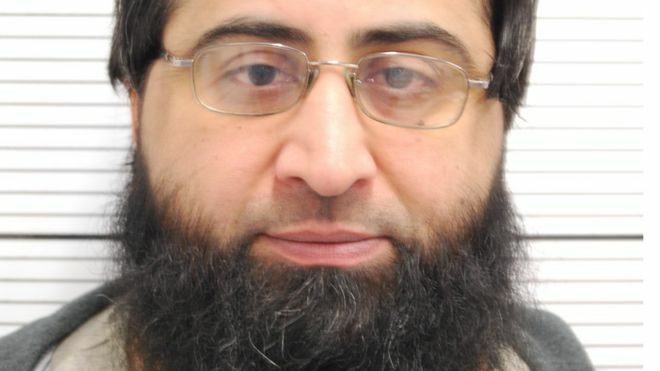 Mr Jilani was also at the centre of controversy when broadcasting regulator Ofcom fined Islamic station DM Digital £85,000 in 2013.Mr Jilani reportedly said Muslims were under a duty to kill those who insulted the Prophet Mohammed during an on-screen sermon. He told the Evening Standard that his remarks were in response to a question about Islamic law as applied in Pakistan. He said: “I vehemently deny advocating the killing of anyone; this is terrorism. I have spoken out several times against terrorism in public.